Here’s our pick of Irish events you can happily cart your new baby along to, exploding nappies and all. 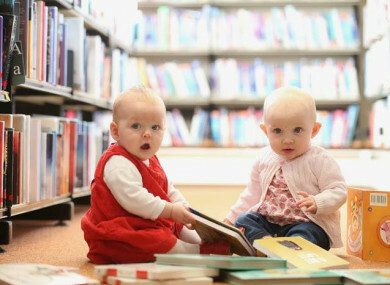 Two happy bookworms at one of DLR LexIcon's recent Baby Book Clubs. IF YOU’RE ON maternity leave right now, you’ve probably noticed that the number of weekday events that you can happily cart a baby along to is, well… not that high. Luckily with some sleuthing you’ll find there is quite a bit going on, from one-off events to regular meet-ups. Here’s our pick of what’s on around Ireland in the coming days. Baby Book Club: Sara Keating runs a monthly baby book club in Deansgrange Library with experts are on hand for advice on read to your baby. Plus it’ll give you a chance to meet other parents who love reading. There’s also one on at the DLR LexIcon in Dun Laoghaire. Suits: Parents of kids aged 0 – 3. Time: 10am, final Tuesday of every month. Where: Deansgrange Library. Find out more here. Blooming Babies Massage: Baby massage classes are a great way to bond with your baby and come in extremely handy during the no sleep nights that are to come. Laura Cummins of Blooming Babies offers a five-week course of five 90-minute classes for €120. Find more classes from other teachers nationwide on Baby Massage Ireland’s website. Time: Wednesday mornings (subject to change). Where: Douglas Yoga Centre. Cost: €120 for five-week course. Up to €100 may be redeemable via health insurance. Find out more here. Baby-friendly swims: There are several nationwide baby swimming schools taking to local pools on a weekly basis. It’s a brilliant way of introducing babies to swimming, while meeting other parents and getting into the water yourself. Check waterbabies.ie or aquababies.ie for listings. When: weekly, varies. Where: nationwide, varies. Find out more here and here. Babywearing Ireland meet-ups: Babywearing Ireland organises meet-ups all over the country. Get advice on how to use baby slings, meet sling consultants who’ll help you find the one for you, and have a cup of tea with other parents. When: weekly, varies. Where: nationwide, varies. Find out more here. Baby-friendly cinema screenings: Most local cinemas show a new movie on a weekday morning that welcomes new parents and their babies. This is an opportunity to meet new parents, but more importantlu, enjoy a whole movie without worrying about your crying baby or exploding nappies. When: weekly, varies. Where: nationwide, varies. Find out more here (Dundrum), here (Odeons nationwide) and here (Lighthouse). Parent & toddler groups: Your local HSE nurse will have a list of all parent and toddler groups in your area and it’s well worth checking them out. You may think that you’re not a ‘joiner’, but from one mum to another, these groups are a fantastic way of opening your local social circle. When: weekly, varies. Where: nationwide, varies. Cost: Free. Find out more here. Win a pair of Nokia 2 phones, with a two-day battery life to ensure the whole family can stay in contact. Enter here - and don’t forget to follow us on Facebook and Twitter. Email “6 events for mums on maternity leave - from book clubs to baby-friendly movie screenings”. Feedback on “6 events for mums on maternity leave - from book clubs to baby-friendly movie screenings”.